A work verification form is much needed when you are about to hire a new candidate in your organization. These forms enable the current employer to verify whether the chosen candidate has been completely truthful about the previous job experience he has noted in his resume. 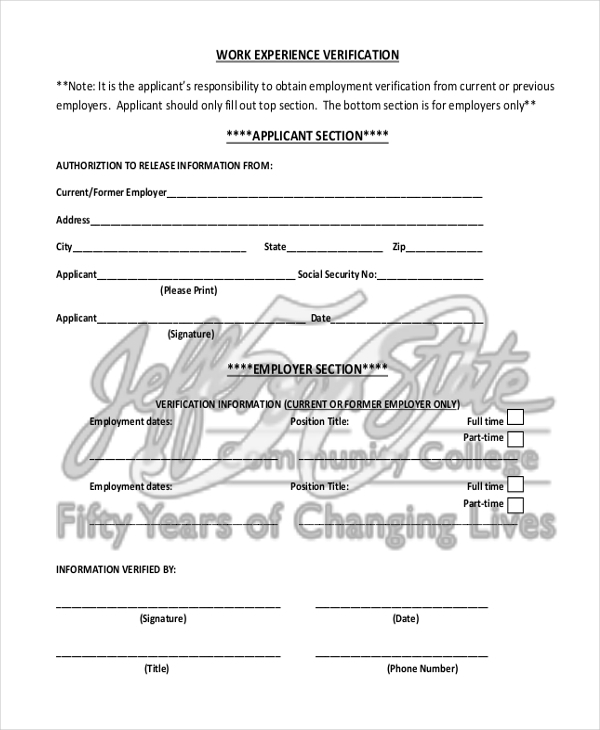 These Verification Forms would be sent by your company’s HR department and would be completed and authorized by the candidate’s former employers who will then send the form back to your HR department. This is a smart and professional work verification form that would be really useful to your company’s HR department. It comes with pre-designed spaces where the former employers of your chosen candidate can mention about the employment dates and position titles. It also allows you to know whether the candidate used to work full time or part time with the previous employers. 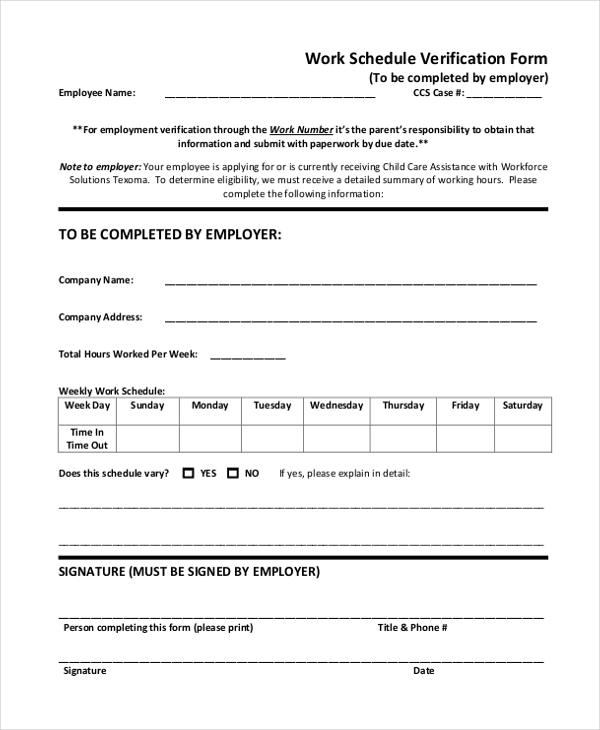 This work schedule verification form is for those employees who are getting Child Care Assistance and the organization offering it needs to know about its work schedule. The form comes with sections on the basic identity information about the company, total hours of work slated for the employee and a breakup of weekly work schedule. This form is for those looking to take part in the Australian government approved voluntary work and comes with separate sections to be filled by the candidate as well as the voluntary organization. It has got sections on the identity information of the candidate, the organization and other details about the person- like Centrelink reference number, the name of local service center etc. This work verification form will allow your previous dental clinic that is to include all the important information about your employment history as pursued there. These include the duration of years, month and weeks of your working or volunteering in that clinic, the total average number of hours worked, specific duties, skills and a brief history of training. If you are looking for a wage verification form for your chosen faculty in your academic organization, this form would be really helpful. The form allows the details of candidate’s previous employer, the occupational experience, teaching experience, and most important job responsibilities carried out by the candidate. It can also be used for those candidates into self-employment previously. 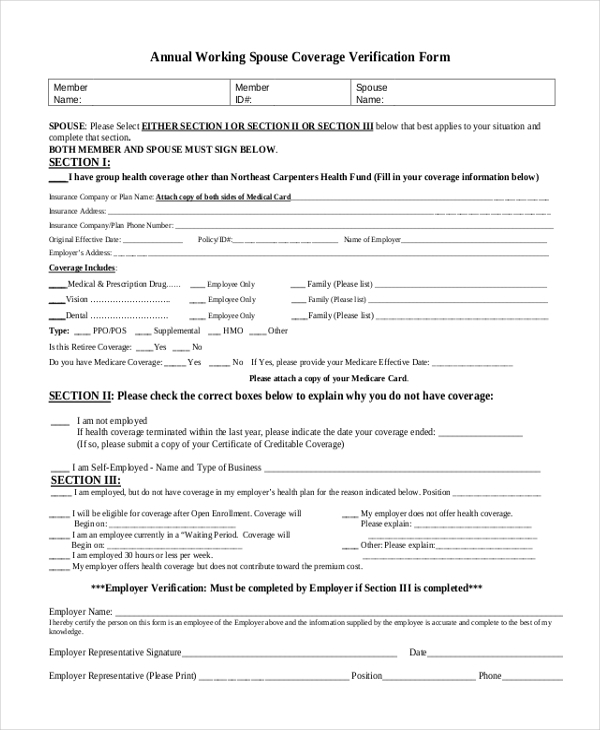 If you are looking for working spouse insurance coverage verification form, this form would be really helpful for you. The form includes sections on the insurance coverage package, the name of the insurance company, medicare coverage, insurance details as an employee from the office and so on. There is also a space for employer’s verification. 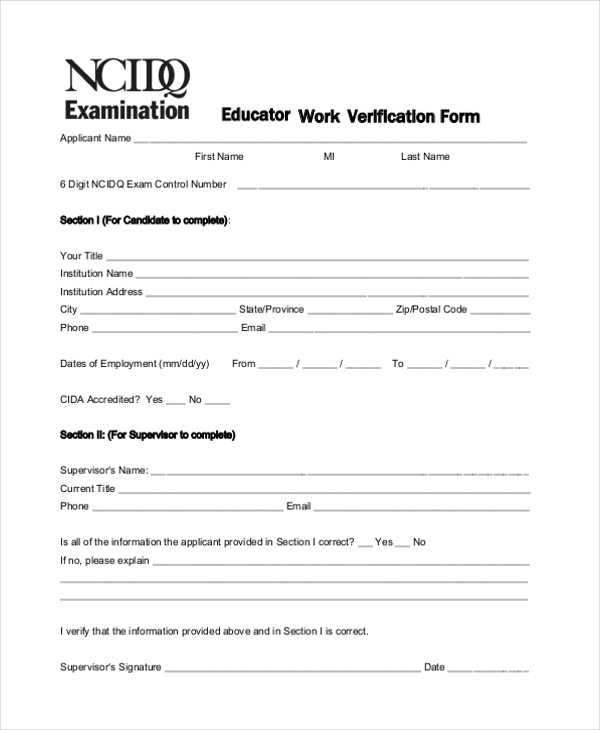 This educator work experience verification form will collect details from the candidate about his previous date of employment, name and address of the previous organization and also whether the institution is CIDA accredited or not. It also provides a space to be fulfilled by the supervisor along with instructions for the candidate on how to fill the form. What is The Purpose of Work Verification Form? The main purpose of work verification form is to get a thorough check on the work experience of a candidate whom a company is about to hire. Yes, the candidate will mention his work experience in his resume but you never know whether he is being completely honest or not. There have been cases where candidates have lied about their salary, work duration, major skills and so on which fell heavy on the current employer later. The work verification form comes as a great help here where all the principle data about the candidate would be furnished and authorized by the previous employer/s. This way, in case, any discrepancy is detected later, the current employer can easily contact the previous employer for accountability. You may also see Wage Verification Forms. Who Needs Work Verification Form? A work verification form is needed by anybody looking to hire a new candidate in his or her organization. No matter whichever industry you belong to, be it a college or a dental clinic or a restaurant or an IT firm. Whenever you are zeroing on a candidate, you have to get a work verification of that individual through a work verification form. It’s the HR department of your office who will pass on the work verification form to the candidate so that he can send it to his previous employer. The former employer will include the job history and then send it to your HR. 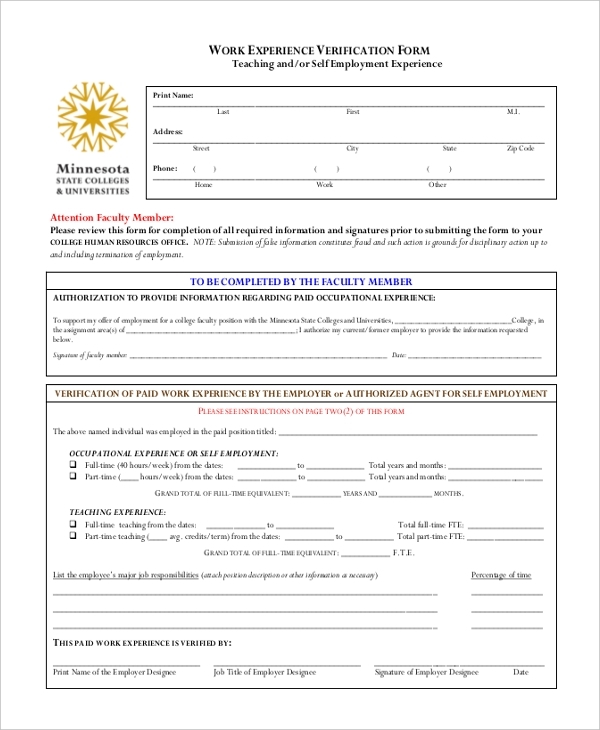 Organizations offering child care assistance would also need such forms. What Does a Work Verification Form Cover? As the name suggests, a work verification form covers the basic needed details about a person’s previous job experience. Such forms mostly come up with two sections to be filled by the candidate and his/her previous employer/s. There would be sections on how long the individual had worked in his previous offices. Then, there would be the mention of his designation, nature of work, the major responsibilities he has handled, the skills that he has acquired and so on. Some of these forms also contain sections on the salary received by the candidate. Besides, such forms are also known as insurance verification form as many of these forms come up with sections on the insurance coverage of the candidate. You can also see Employment Verification Forms. 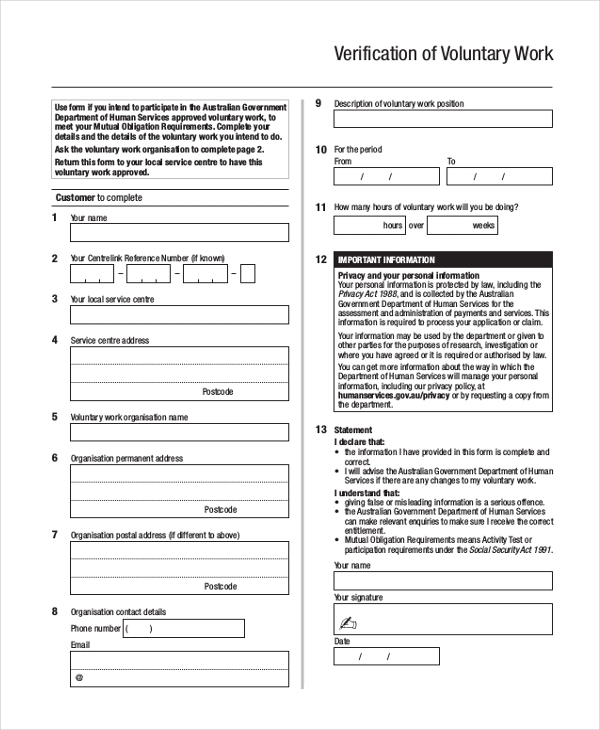 If you are looking for samples on work verification form, the forms mentioned above would be of great help for you. These pre-designed forms will save you from the tedious task of designing the entire thing from scratch and you would just need to download and modify them according to your specific data.